Providing the ultimate in laser hair removal treatment, our Candela GentleMax™ laser offers a gentle, non-invasive, long-term hair removal solution to both men and women for unwanted hair anywhere on the body. We offer customized laser hair removal treatments based on your hair colour, texture and body location. As a general rule, the darker the colour of the hair compared to the skin tone, the better the candidate for laser hair removal. Call now for your free initial consultation where our friendly staff will be happy to answer any further questions and provide you with a quotation and discuss your treatment program. A Test patch is performed at the initial consultation in order to observe and assess your skin’s reaction to the laser energy levels selected and ensure that the treatment method is safe and suitable for you. The treatment has a slight sensation of heat combined with cryogen (coolant) with each pulse. We have found when compared with the GentleMax™ most IPL and other laser machine treatments are considered painful. We do not use messy gels, or ice packs for hair removal because of the unique dynamic cooling device, where cryogen is sprayed onto the skin, cooling and protecting the upper layers during the laser treatment. This not only increases your comfort, but also greatly reduces the chance of side effects, such as overheating the skin, which could result in burning and scarring. Keeping the skin cool during the procedure is an important factor in inhibiting the skin’s absorption of laser energy. It is important to minimize the absorption of the laser energy (heat) by the skin during laser hair removal treatments. With the unique built in Dynamic Cooling Device, we are able to keep the skin cool during the treatment without the use of cold compresses which can be painful and dramatically slow down the procedure. Other than all the other attributes mentioned in our Frequently Asked Questions section it is important to note that although some IPL machines have larger spot sizes, there is still a delay before each pulse is administered as the machine charges up. The Candela GentleMax™ doesn’t have any delays between pulses, so we are able to execute treatments twice as fast as, and more comfortably than other lasers on the market. We also have a range of spot sizes, which enables us to select the most suitable size for the area being treated. Consider for a moment treatment of the area between the eyebrows with a large spot size. Machines without choice of spot sizes also unnecessarily expose some skin areas to heat that don’t require treatment. Some IPL machines use icepacks to cool the skin down before and after pulsing, this is not only uncomfortable for clients, but time consuming too. Understanding the various capabilities of the different types of hair removal lasers will help make your selection of a laser hair removal clinic that much easier! 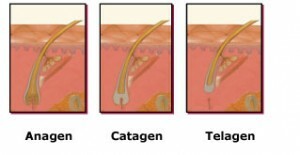 The laser selectively targets the melanin (pigment) inside the hair follicle. Heat is absorbed and destroys the cells lining the hair follicle, specifically around the bulb, bulge, and vascular supply. The energy selectively disables both the papilla, which nourishes the hair and the stem cells in the hair follicle, which generate the hair growth in the follicle, without damaging the skin. Once the hair germination structure is damaged, future hair growth in that follicle ceases. Because hair grows in cycles, follow up treatments are needed to treat any new growth. Multiple treatments allow the laser to reach more hair follicles during the active growth phase (Anagen) for optimal results. The length of the total growth cycle and the duration of the alternate rest periods vary greatly from body region to body region, and from person to person. Therefore the best indicator of when your next treatment is due is within 7 days of the new hair growth appearing. This will be explained in more detail during your consultation. The number of treatments required for long-term benefits depends on the area being treated, your hair density, and the hair’s growth cycle explained above. 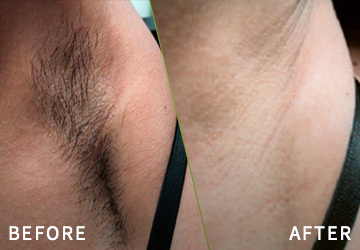 Although each client is unique, experience has shown that you can expect an average of 6 treatments spaced 4-8 weeks apart, depending on the body location of the unwanted hair. Additional factors including age, ethnicity, weight, hormones, diet, medication and metabolism can influence hair growth and play a role in the location. As a rule, men will require more treatments due to the higher levels of testosterone in the body. All of the above attributes and the knowledge of your therapist should be considered when making a decision with regards to the laser hair removal clinic you are going to select.